COMMENT: Thanks for helping people with diabetes. I have tried Apple Cider Vinegar before meals and my Blood Sugar comes down. Fenugreek and cinnamon are great too. So are wild melon,bitter gourd,jamuns. I wish someone would come up with a permanent cure for Diabetes. It is good to hear that you have found a natural remedy to beat your diabetes. I congratulate for your good willing to lower your blood sugar naturally. It is true that apple cider vinegar can help lower blood glucose. There are many studies determining this effect. For example, the blood glucose of 11 type 2 diabetics having 2 tbs of apple cider at bedtime, were found to be lowered 4% to 6%. 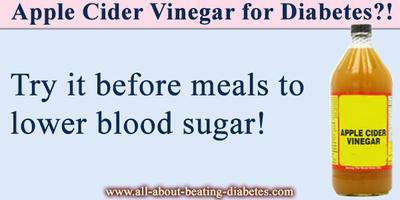 In addition, cider vinegar could help diabetics losing weight as it increases the feeling of being full while eating. Since ancient times, fenugreek, cinnamon and bitter gourd have been used for general health and diabetics in particular. With regards to jamun, to my knowledge, it is referred to an Indian type of Black-berry. Besides being an excellent source of many vitamins and minerals, it has been used in the Ayuverdic medicine in treating diabetes. Particularly, its bark is used to beat the thirsty feeling of diabetics, while its powdered seeds are good to lower blood sugar. This is true because, if powdered seeds are taken as a juice up to four times per day, it can enhance the action of insulin, especially true in type 2 diabetics or those with insulin resistance. As I was not able to find any true resource regarding what wild melon can do to lower blood glucose, could you please provide more info? We appreciate your help! All the best! There is a cure for type 2 diabetes. It's changing the habits that created the situation in the first place. That doesn't even work for disease if you keep exposing yourself to pathogens. The cure is simple, eat foods that are as close to natural (read unprocessed) as possible, stick with vegetables primarily until you get your glucose back to where it should be, then add fruits in moderation. (Use natural aids like Apple Cider vinegar, chia seeds, spirulina, cloves, fenugreek, bitter melon, cinnamon to help get those numbers down). Bread, crackers, chips, potatoes, pasta, candy and cakes are not necessary parts of a healthy diet, they are killers that should only be a part of the human eating experience on rare occasion. As for exercise, build a little muscle, boost your metabolism with regular cardio. Move for an hour a day. It's easier than you think. CONCERN: I want to say thank u to u all for trying to help we with type 2 diabetes, and a big thank u to rihana too. Pls I will like to ask that how can a pregnant type 2 diabetes cope wit pregnancy and what other things should we avoid or do? Thank u. It is true that being a type 2 diabetic and pregnant at the same time is really a tough thing. However, as there is exist always a remedy for everything in our life; hopefully, with some simple and consistent steps, a type 2 diabetic can overcome pregnancy problems too. Although it might seem difficult to follow, you should be consistent and never give up as this is the right key: DETERMINATION. Try using Walnuts and Amla about four times per day. Small amounts. It works for and a few diabetic friends.In the Caribbean, Amla is known as Gooseberry. QUESTION: What is the right way to take the apple cider vinegar? How much time before meals and whether to be mixed with something or taken as is? Although apple cider vinegar is very efficient in lowering blood glucose, however, one should be careful when using it. Yes, there exist certain undesirable effects when using apple cider vinegar for long time. However, if you follow the right instructions and combine with other natural alternatives, you can avoid such effects from setting. How Much apple cider vinegar? QUESTION: How much apple cider vinegar should be taken before meals and how long before meal. Although apple cider vinegar is a very efficient natural method to lower blood sugar; however, you should obey to some rules to correctly use it. To obtain the best results, you should take it 2 to 5 minutes before eating. In addition, keep in mind its side effects when using it. QUESTION: I am a Diabetes patient and want to cure with natural Herbs. Could you please guide me the method of Cinnamon use for control of Blood Sugar. I am glad to hear that you have chosen a natural way to control your blood sugar. I hope you will be persistent in your long way of beating diabetes. It is very easy to use Cinnamon, either in its powder or capsule forms. However, you should not exceed more than 500 mg per day. I am 38 years old suffering from diabetes what doctor should i refer to. Presently i am in the middle east and taking medicines from my family doctor but my sugar level are come down but not under control. If i have to see a specialist. Which 1 should i go for? If you see that you are controlling your blood sugar very well, just ask your family doctor to refer you to the endocrinologist (the specialist who is following diabetics).